Complete with truck, box, inserts, battery card & rare shipping carton. Measures about 13″ in length. 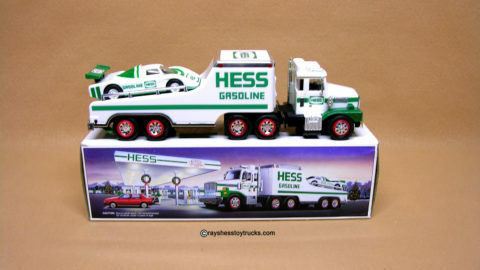 This was the first Hess bank truck made. The truck is a redesigned version of the 1977/1978 Oil Tanker Truck with a coin slot added on the rear of the tanker. The truck is the rare “Black Switch” version as the red switch is usually found on this year. It has working head and taillights, and a removable hose. The other major difference is that there are no more decals used on this truck, so you do not have the wearing or peeling of them anymore. The box has bright graphics and complete with both top & bottom inserts and battery instruction card. Also included is the hard to find original shipping carton & Seasons Greetings card from Hess in 1984! NOTE: address has been blocked out for picture to protect old owner but mint & readable on box as delivered. The truck has the rare black switch on the bottom where it is usually red. Measures approximately 13″ in length and is in mint condition. Lights have been inspected and are all in working order.